Mako Yoshikawa has studied at Columbia and Oxford. A doctoral candidate in English literature at the University of Michigan, she lives in New York City. She is the great-granddaughter of a geisha. ONE HUNDRED AND ONE WAYS is Ms. Yoshikawa’s debut novel. 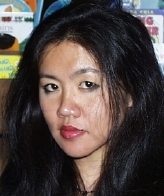 Dennis Y. Ginoza spoke with her at the Elliot Bay Book Company in Seattle. Her answers are presented here in RealMedia 5.0 format (non-streaming). To listen to these files, you will need the free RealPlayer software.